Sometimes you want to make a diagram of your photo session. (OK, sometimes you don’t, but sometimes you do). I, for example, am going to use studio lighting diagrams for explaining about low key and high key studio setups. If you are like me, with two left hands in all that related to sketching, you are in a tight spot. When I draw (just like when I write), only one person in the world can understand what I wrote. Sadly, I have not met him yet. So the solution to my situation is to use lighting diagrams “out of the box” with no handwriting involved what so ever. Ahhhhh…. sounds like heaven, right? Great, how do you get one? 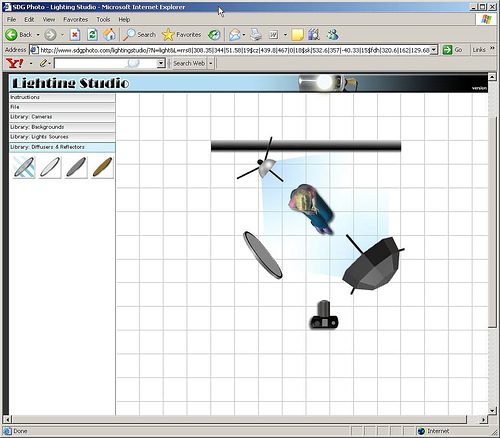 Both Rui and Strobist have pointed out two great sources for creating lighting diagrams. One requires Photoshop and the other one is online. I’m going to show both. The first method involves using a Photoshop PSD file, created by Kevin Kertz, with all the studio and lighting elements you can think of: diffusers, flashes, gobos, grids, bookends, it’s all there. You start up with a nice sheet of paper and can add or remove elements. Each element is drawn in a separate layer, and you can selectively select (is that legal to say) which element to display. 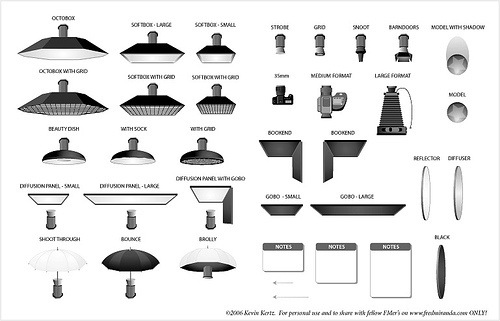 Check out the huge selection of lighting and studio assortments below. You can get the PSD file right here. (Well worth the 160kb of bandwidth). If you want to learn more about what you can do with this PSD file, go and have a look at Maurice Mc Duff‘s work. I just love this guy. 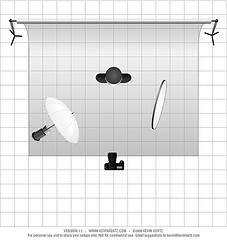 Not only does he share his lighting diagrams, but he also gives free studio workshops. Lastly, if you want to see what kind of image this setup will produce just click on the image and follow the link. Photographer Geren W. Mortensen, Jr. is sharing his setup. I recommend anyone who is practicing studio lighting to upload a scheme of their setup (it does not have to be a big bombastic Photoshop created art. it can also be a simple sketch with mspaint or sketch by hand). You will both share your knowledge and get better comments. 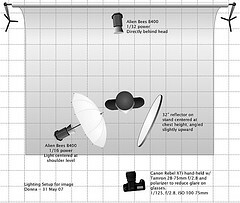 I am telling you about this now, because I am going to be using those diagrams when explaining about high key and low key lighting schemes, and I just know that the first question that will pop is going to be “Man, how did you do those cool lighting schemes?” (Wanna make sure you catch this article? grab my RSS feed).